If you've got the burning desire to bust out some tire-shredding drift action in a wild and exciting package, look no further! The HPI Sprint 2 Drift is the car for you. The Sprint 2 Drift is the drift version of the Sprint 2 Sport and has most of the same features: composite double-deck chassis, dual belt drive, maintenance-free gear diffs, waterproof electronics and hassle-free 2.4GHz control. The RTR Sprint 2 Drift is fully waterproof and ready to tackle wet conditions like rain and snow. The new 2.4GHz receiver is safely stored in a brand new waterproof receiver box, protecting it from the elements and ensuring glitch-free operation. The SF-10W waterproof steering servo and SC-15WP waterproof electronic speed controller complete the package, allowing you to enjoy the action on the road no matter what the weather is like! 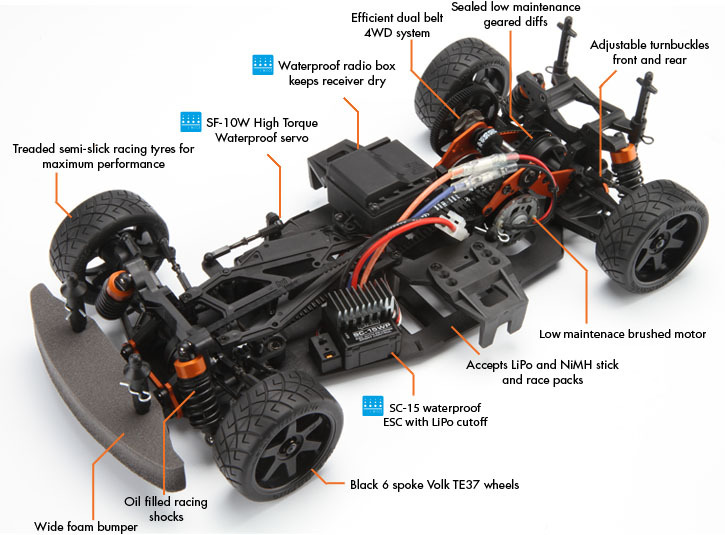 All HPI kits are fitted with a comfortable and feature-packed HPI 2.4GHz radio system for supreme control and confidence! The radio features a pistol-grip design with drop-down steering wheel, 3 channel functionality, easy carry handle, fold-down aerial, end point adjustments, servo reversing and steering dual rate. It's also extremely lightweight due to it requiring only four AA batteries. You won't have to worry about radio crystals or what channel other RC racers are using with our 2.4GHz technology - the radio does all that work for you! The radio prevents frequency conflicts automatically and changes channels if there is any interference. Finally, if you ever lose radio signal or battery power, an electronic failsafe will bring it to a safe and controlled stop. You'll have professional-level control in one easy RTR package! From the authentic sports car looks to full adjustability of the suspension geometry, the RTR Sprint 2 Drift is the complete package. 2.4GHz radio, full ball bearings, waterproof electronics, silicone oil-filled shocks - it's all there on the RTR Sprint 2 Drift , precision built from the factory!